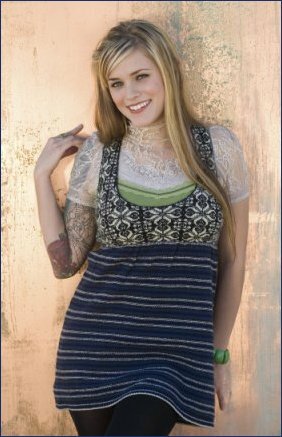 Megan Joy has no regrets about her American Idol journey and said she learned a valuable lesson about accepting criticism. Megan Joy cared about remaining on American Idol. However, she was also certain that she had no chance of surviving Wednesday's results show before she had even arrived at the studio. Megan Joy was revealed to be the fifth finalist eliminated from American Idol's eighth season during last night's live results show broadcast on Fox. Kara DioGuardi's heckler has apparently been unmasked. American Idol's Top 9 eighth-season finalists took to the stage and performed during last night's live broadcast of the Fox reality competition's fourth finals round. The Top 9 finalists -- Danny Gokey, Kris Allen, Allison Iraheta, Adam Lambert, Lil Rounds, Scott MacIntyre, Megan Joy Corkrey, Anoop Desai, and Matt Giraud -- all had the freedom to sing any song they wished, so long as it was a top seller on iTunes, one of the show's primary sponsors. Prior to the first performance, American Idol host Ryan Seacrest spoke to the judge Randy Jackson about Top 9 was shaping up. Michael Sarver was revealed to be the fourth finalist eliminated from American Idol's eighth season during last night's live results show broadcast on Fox. American Idol's Top 10 eighth-season finalists took to the stage and performed during last night's live broadcast of the Fox reality competition's third finals round. The Top 10 finalists -- Michael Sarver, Danny Gokey, Kris Allen, Allison Iraheta, Adam Lambert, Lil Rounds, Scott MacIntyre, Megan Joy Corkrey, Anoop Desai, and Matt Giraud -- all sang the songs of Motown Records, with music legend Smokey Robinson serving as the week's mentor. Alexis Grace was revealed to be the third finalist eliminated from American Idol's eighth season during last night's live results show broadcast on Fox. American Idol's Top 11 eighth-season finalists took to the stage and performed during last night's live broadcast of the Fox reality competition's second finals round. The Top 11 -- consisting of Alexis Grace, Michael Sarver, Danny Gokey, Kris Allen, Allison Iraheta, Adam Lambert, Lil Rounds, Scott MacIntyre, Megan Joy Corkrey, Anoop Desai, and Matt Giraud -- all sang Grand Ole Opry songs for the competition's sometimes infamous "Country Week," with country superstar Randy Travis serving as the week's mentor.